Everywhere is dark for you, Advocate Banoo. Why are you silent, as if you were dead? so why do you remain silent? Say to me, I sympathize with you, shed tears for you. Say to me, I am afraid of the darkness, of the night without you. I am like you, full of unspoken words and obsessions. The mirrors have tired, looking for you, Advocate Banoo. Why don’t you show them your face? When you smile, the mirrors become happy. and sadness. Don’t let anyone waste your wishes. But do not dwell on the hardship you carry. Do not let the barriers and limitations stop you. Show your ability to those who think you’re weak. You can go farther, be stronger. Shout your achievements. Show your skills in action. You have the power to remove injustice. the sun’s light and smile in the face of all sadness. Come be with me all the time. Experience my aches. Understand me. how difficult it is being a girl in today’s life. 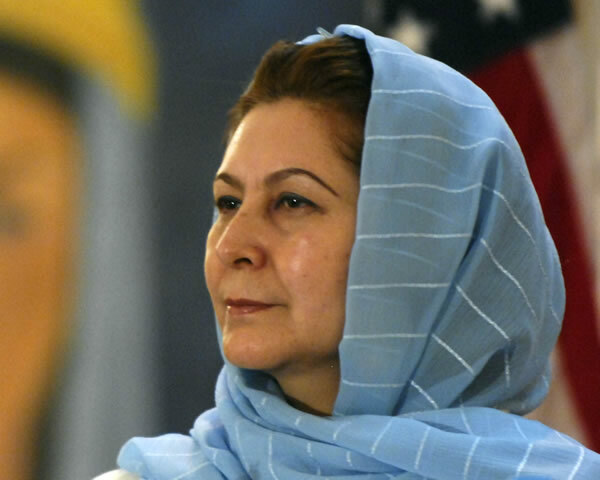 Husn Banu Ghazanfar serves as the Minister of Women’s Affairs in Afghanistan. She is also a writer, a poet, and a speaker. Photo by Daniel Wilkinson. This line will stay with me a long time, Friba. Thanks alot from your nice comments on my pieces every times. after it i will try to reply all your nice comments. It’s a wonderful writing and super. It has such a strong massege .